Abby Anderson and her husband, Mark, moved to Nigeria in 2011 to manage the construction portion of the revitalization of a rural teaching hospital supported by Samaritan’s Purse. They recently finished their work, but before leaving Nigeria, they had an incredible experience. Recently, we had an amazing opportunity. We were invited to visit a Fulani camp about one hour from Egbe. 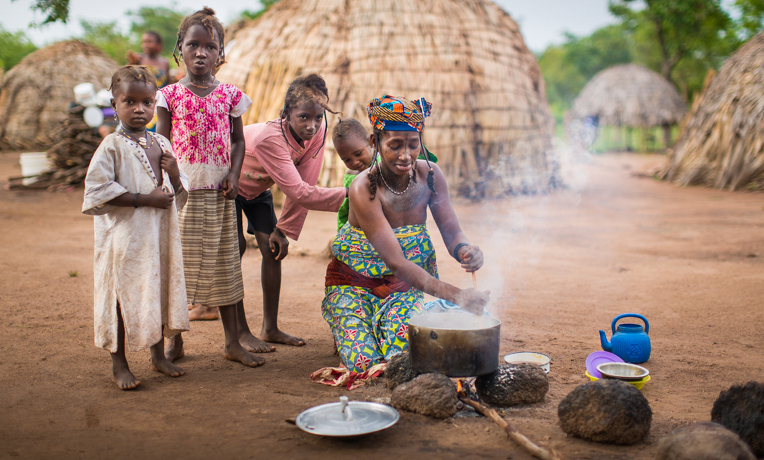 The Fulani people are a Muslim nomadic group that farms and raises cattle. Being invited to enter their camps is a very rare opportunity, so we were excited to go. The Fulani speak Fulfulde, so it was difficult to communicate. And communicating with hand gestures doesn’t quite work out there as many of them are offensive to the Fulani! They shined a flashlight on my teeth, and they wanted to touch my hair. They pulled on my bangs, and they lifted them up. They rubbed where the hair meets my scalp, trying to figure out if I was wearing a wig. They asked through the interpreter what kind of oil I put on my hair. 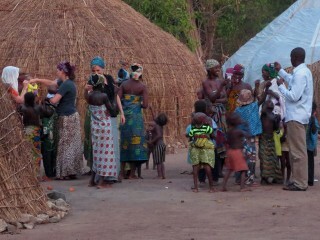 Abby and others in her group spent time forming relationships with the women in the Fulani community. I touched their hair in return. They often wrap pieces of plastic around their hair to make designs. It looks like a stocking cap, the kind with the ties and the puff ball at the end. The babies have their heads shaved in random patterns. Many of the children had tribal markings on their face that are usually cut with a knife when they are babies. Then they scar, leaving the marks of their tribe. One baby was only about 3 months old and had the markings already. All of the kids were 12 and under. Once they are older than that, the boys are sent to learn how to take care of the cattle, and the girls are married off. None of the men were allowed to enter the camp, but Mark was able to meet with the men and talk with them in their area next to the camp. The group we went with has been working to develop a relationship with this camp to reach with them with the Gospel of Jesus. They passed out Megavoices, a solar-powered audio Bible in their language. We watched some Nigerian Christian music videos in their language, and I danced with the women and children. I am so thankful to have had this opportunity before leaving Nigeria. I will never forget it! I still can’t truly imagine how different and difficult the lives of these women are compared to mine. I’m so thankful that I have Jesus and the amazing hope, joy, and peace that He gives, and I hope that these people will one day experience that joy too.